You’ve no doubt looked at Internet marketing to earn some extra income or perhaps even to make it as a full-time job. You’ve read special reports, downloaded eBooks, subscribed to lists and participated in forums, but you’re still unsure where to really begin. The gurus make it seem so easy. They make it seem like anyone can do it. You’re assured that you, too, can do what they do. And, they’re right! When the Gurus Do It So Easily! It’s not that the gurus are any smarter than you are, it’s simply that they know things that you do not. Many of them started at the same point you are today, perhaps even worse! Many of these now-experts had to crawl their way to success in Internet marketing through trial and error. Today, they may be able to make more in a day than some struggling Internet marketers make in a year. You might even have a few of these gurus’ Internet marketing products on your hard drive. You may have purchased them thinking you’d get the inside track on things, only to be left baffled and needing an aspirin. You’ve probably felt as though something was missing. You may already have read eBook after eBook on Internet marketing, and you still don’t get it. You may even feel like the gurus are holding things back from you, enticing you with just enough information to get you to buy, but not enough information to let you succeed. There’s No Conspiracy — There’s No Secret! The truth is that the gurus aren’t trying to hide anything from you. The problem is that some things are so second nature to them that it doesn’t even occur to them that you don’t know them. They are not intentionally omitting any vital information; it’s just that some things are almost as natural to them as breathing. Imagine trying to teach someone how to ride a bicycle—with an eBook! No doubt you’d leave a few things out, not because you didn’t want anyone to learn them but because it just never occurred to you to mention them. They were second nature to you. It’s the same type of deal with the gurus! But, with the Internet Marketing Backstage Pass, you’ll get those important details! It’s like your ALL-ACCESS pass to the backstage, nitty gritty, doo wop ditty dum ditty details of the Internet Marketing world. If you have half a dozen Internet marketing eBooks on your hard drive or have spent months or even years “learning” Internet marketing, but don’t have anything to show for it, you may have this problem explained on page 11. It’s one of the biggest hurdles you’ll need to overcome. By Itself, this “Mindset” Guide Might be Enough to Get You Fired Up—But There’s More! From there, you’ll move into the next volume: Landing the Gig: The Fundamentals of Internet Marketing. This massive volume answers dozens of questions new Internet marketers frequently have. No stone has been left unturned in the effort to provide you with every bit of information you may have been missing! The volume starts with some of the basics, like “What is a Website?” Simple, right? Then, it covers the difference between static and dynamic websites; blogs, forums and portals; domain names, URL, WHOIS and more. Pretty simple; you may be able to skim some of these. From there, it covers cybersquatting, 301 redirects, domain masking, and .htaccess. Then also favicons, sitemaps, traffic and how to get more traffic to your website. The volume then moves into web page design and coding questions, followed by scripting. Note that these sections just give you an overview. This is not a coding and scripting guide! Also, if you’re unfamiliar with WordPress, many of your common questions will be answered. Very Important: On pages 82 and 159, you’ll learn the difference between WordPress and, um, WordPress. There are different types of WordPress and, if you use the wrong one for Internet marketing, you could wake up one morning and find all your hard work deleted! Many new Internet marketers struggle with understanding links. If you’re among them, don’t worry! A complete section just focusing on links starts on page 95. The volume covers backlinks, organic links, link masking, anchor text, DoFollow/NoFollow and more. Plus, you’ll learn about specific Internet marketing techniques and skills, such as bum marketing, forum marketing and keyword research. The huge risk of using PLR materials. This is hardly ever mentioned in the Internet marketing world, but could cost you thousands of dollars! Learn about the risk and how to mitigate it, starting on page 146. How to determine what to outsource (plus a list of outsourcing sites) starting on page 148. Learn the common mistakes made by affiliate marketers (page 162). A list of many advertising programs (more than just AdSense!) on page 170. The “money making” info continues in the section on “Selling” which covers Master Resale Rights, Resale Rights, Site Flipping, Domain Flipping and more. More “money making” information can be found in the subsequent section, “Physical Products”, which covers drop shipping, wholesalers and print on demand. The big thing these days is Social Networking and that certainly has not been overlooked here. On top of that, with Twitter’s growth in users and popularity—and everyone and their dog signing up—a complete guide to using Twitter begins on page 231. Plus there’s a list of some popular Social Networking sites on page 260. Video Marketing isn’t forgotten either, and a list of video sharing sites is on page 262. From there, you’ll jump right into “Staying in Touch” with a mailing list, doing it the right way via opt-in. If you’re looking for “spamming” techniques, you won’t find them here! This Is the Point Where Other Product Creators Would Call It a Day! But I didn’t because there are two more topics of vital importance which are commonly overlooked: Security and Legal. As I mentioned earlier, no stone was left unturned in my effort to deliver to you every bit of information you need to get started in Internet marketing. And, if any information is not included, I tell you where to find it! The Fundamentals of Internet Marketing volume features a full Table of Contents, plus a complete Index so that, long after you’ve read it, you can continue to use it as a reference volume and quickly find the information you need. The Crimes We Commit—Against Ourselves! By the time you’ve completed both volumes, you’ll have learned everything you need to know in order to get started in Internet marketing. Sadly, that’s the point where many people stop. They absorb the knowledge and then get lost in daydreams about how much money they’ll make, and they never actually get started doing anything. When prodded, they’ll make excuses. It’s a crime (and a crying shame!) for those people not to use the assets in their virtual hands and use them to their advantage. I don’t want that to be you! That’s why I’ve also created a third volume: Going Out on Tour: The Internet Marketing Action Guide. You’ll have no excuse not to get started in Internet marketing because The Internet Marketing Action Guide includes three website templates to get you started. There are two HTML site templates and one PHP site template. Complete instructions are included to show you how to use these website templates to learn how sites are put together so you can create your own! You can use the templates as-is, after adding your own content of course, or modify them to your heart’s desire. One HTML template is designed as a sales letter and the other two sites (one HTML and one PHP) can be used to build your own mini-sites. The guide also lists sources for content for your website. And, if you don’t want to build your own website, there are sources to help you around that too! This volume also contains a marketing plan for product creators or affiliates and a traffic generation action plan for driving traffic to your website. With these tools at your fingertips, you have no excuse not to take action and move your budding Internet marketing career forward! I really can’t make things much easier for you! Or can I? But Wait—There Really is More! Even after all that, there will still be people that will make excuses not to get started. As I’ve mentioned, I don’t want that to happen to you. I don’t want you to read The Internet Marketing Backstage Pass and not take what you have learned and put it to work for you. I don’t want you to have any excuses to be a slacker. That’s why The Internet Marketing Action Guide also includes two ready-made mini-sites that you can put to use! Each has five pages of content to get you started. You can modify them, add to them, and so on. They are both pre-configured to show AdSense or ClickBank ads. You just need to setup an account with either of those services and plugin your information into the site. Configuration instructions are included in The Internet Marketing Action Guide. You’ll develop the right mentality to be an Internet marketer, you’ll have the knowledge to be an Internet marketer, and you’ll have action plans and two websites to get you started. What more could you ask for? How About Scoring Some Sweet Swag? No excuses!, remember? 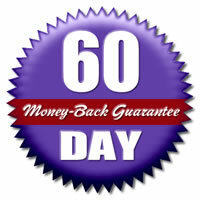 Every Internet marketer needs some graphics to get going: things like backgrounds, buttons and seals. Not to worry! I’m giving you a starter set with a Graphics Pack, all fully illustrated in the fourth volume, Score Some Sweet Swag: Graphics Pack Catalog, so you can easily choose the graphics you want to use for your project. Notice that pretty cloud background behind the buttons and seals? It might be a bit difficult to see with everything over top of it, but, yeah, you get that too. The Internet Marketing Backstage Pass is the definitive guide to getting started in Internet marketing. Kind of like the old Chinese proverb, the best time to get started in Internet marketing was ten years ago. The second best time is today! It’s a dog eat dog world out there, but just when someone thinks he’s the top dog, a shark jumps out of the water and eats him! So, it’s never too late to get started in Internet marketing. If you’ve struggled to learn, jumping from eBook to eBook, site to site, project to project, or if you’re considering Internet marketing for the first time, you owe it to yourself to get started with all the information you need in one place. Now it’s time for you to make a decision. Do you want to hunker down and get serious about Internet marketing, or do you just want to keep daydreaming about doing it? One thing to keep in mind is that I focus on real, legitimate efforts to building your Internet marketing business. If you’re looking for a “get rich quick” scheme or info on shady practices to make money online, you’ll need to look elsewhere. The Internet Marketing Backstage Pass only gives you information and techniques for building a legitimate Internet marketing machine that you won’t be ashamed to tell your family about. You get all that for just $47. Let me be perfectly blunt: I could easily charge twice that amount (or more) for everything you’re getting here, but I want to make it easy and affordable for you to get started in Internet marketing. That’s why it’s aggressively priced at just $47! But don’t delay! I might come to my senses and start charging what it’s really worth! downloads. A utility such as WinZip is required to unzip (expand) them. Disclaimer: The accuracy and completeness of information provided in The Internet Marketing Backstage Pass and opinions stated therein are not guaranteed or warranted to produce any particular results, and the advice and strategies, contained therein may not be suitable for every individual. The author shall not be liable for any loss incurred as a consequence of the use and application, directly or indirectly, of any information presented in this work. The author is not engaged in rendering legal, accounting, or other professional services of any nature. If legal advice or other expert professional assistance of any nature is required by the reader, the reader is encouraged to seek out the services of a competent professional trained and licensed to provide advice regarding the specific area of inquiry. ClickBank is a registered trademark of Keynetics Inc., a Delaware corporation. 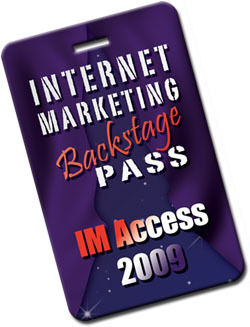 InternetMarketingBackstagePass.com is not affiliated with Keynetics Inc. in any way, nor does Keynetics Inc. sponsor or approve any InternetMarketingBackstagePass.com product. Keynetics Inc. expresses no opinion as to the correctness of any of the statements made by InternetMarketingBackstagePass.com in the materials on this Web page. Copyright 2009-2010 Internet Marketing Backstage Pass dot Com. All rights reserved.